This article originally published in January has been updated. Despite its repeated rejection by the British parliament, both the UK government and the EU hope the divorce deal can be approved, paving the way for an orderly Brexit. Three times this year the UK parliament has voted down the Brexit deal negotiated by London and Brussels, and approved by the other 27 EU governments. Failure to agree on the path ahead has twice forced the British government to seek a delay to its scheduled departure date from the EU, which has now been set by EU leaders for October 31. British parliamentary approval for the exit deal is one of the conditions necessary for its terms to take effect. Without it, the default legal position is that the United Kingdom will leave the European Union without an agreement. The deal consists of two parts: a Withdrawal Agreement covering the terms of the UK’s exit, and a Political Declaration setting out a framework for future relations. In the third parliamentary defeat for the government, the vote considered only the Withdrawal Agreement: covering the divorce bill, citizens' rights and the Irish border. The two previous parliamentary defeats were on the whole package. MPs have voted to force the government to seek to delay Brexit rather than allow the country to leave the EU without a deal. But attempts to find alternative solutions to the negotiated deal have failed to secure a majority for any proposal. On April 2 Theresa May announced an abrupt shift in strategy amid the deadlock, saying she wanted to work with opposition Labour leader Jeremy Corbyn to seek a compromise Brexit deal that can win a parliamentary majority. The British Prime Minister Theresa May insists the deal negotiated with the EU is in the UK national interest and delivers on the result of the June 2016 referendum. Its supporters argue it’s a sensible compromise, while the EU and many in business say it’s vital to avoid a chaotic exit. The controversial Irish “backstop” – the mechanism designed to guarantee an open border on the island of Ireland – was one of the main reasons MPs rejected the agreement. Many “leavers” also argue that the deal leaves the UK too closely entangled with the EU and some say they would prefer no deal at all. Many “remainers”, meanwhile, say the agreement is far worse than current membership terms and fails to deal properly with future relations. Some would like to offer the public the chance to overturn the result of the 2016 referendum. The main Labour opposition says the deal does not meet its six Brexit tests, which include a customs union with the EU. What does the Brexit deal contain? The long Withdrawal Agreement (on the terms of the UK’s exit) and shorter Political Declaration (on the future relationship) were the result of nearly two years of negotiations between London and Brussels. The deal was approved by the British government and the other 27 EU countries in November. The legally-binding Withdrawal Agreement would establish a “transition or implementation period” to run after Brexit until the end of 2020, during which many existing arrangements would stay in place. Although no longer an EU member, the UK would still have to conform to EU rules during this period. The transition can be extended “for up to one or two years”, with a decision taken by mutual consent before July 1, 2020. Critics of the deal argue that far from taking back control — a key pro-Brexit referendum slogan — the UK would be surrendering it to the EU. It would be outside the EU’s institutions with no formal say over rules it would have to follow. The advantage, however, it that this avoids a “cliff-edge” Brexit, giving people and businesses time to adapt to the UK outside the EU. It also allows more time to reach a final deal. The accord settles the “divorce” issues to untangle the UK’s 46-year membership of the EU, largely confirming terms agreed earlier on two priority areas: money and citizens’ rights. It establishes a mechanism for calculating the financial settlement — money the UK owes the EU to settle its obligations. No figure is mentioned but estimates have put it above €40 billion. It includes contributions to be paid during the planned transition period — to run until the end of 2020. If the period is extended, more payments will be due. Many Brexiteers hate the financial settlement because it still involves large sums being paid to Brussels and brings no guarantees regarding the future relationship. However, the EU made it clear from the outset that it’s about settling the bill for commitments undertaken — and it’s been argued that to renege on these would seriously damage the UK’s international reputation. On citizens’ rights, under the deal, EU nationals in the UK and Britons in the EU – plus family members – would retain residency and social security rights after Brexit. Freedom to move and live within the EU and UK would continue during the transition period. People would be allowed to stay when it ends and apply for permanent residence after five years. However, the right for British citizens settled in an EU country to move freely after Brexit within the bloc – as they currently can – remains up in the air and subject to a possible future agreement. This concerns those who want to retain as many of the UK's existing EU benefits as possible. This part of the withdrawal agreement in particular brought about its defeat in January, thanks to hostility among Conservative Eurosceptics and Northern Irish unionists. The Withdrawal Agreement envisages a “backstop” mechanism to guarantee an open frontier between Northern Ireland in the UK, and EU member the Republic of Ireland. This is seen as necessary given the different tariffs and regulatory standards likely to result from the UK’s decision to leave the EU’s single market and customs union. The backstop is described as a kind of insurance policy, should future talks fail to produce a free trade agreement. It would ensure no physical border infrastructure, allaying the risk of a return to the divisions that existed prior to a 1998 peace accord which put an end to decades of political violence. Under the deal, the whole of the UK would remain in a “single customs territory” – seen as a temporary customs union – with the EU until at least July 1, 2020. This could be extended or terminated, but only by mutual agreement. Tariff arrangements would be the same as now. This has infuriated many Brexiteers as it would prevent the UK from applying trade deals with other countries if tariffs are removed. The UK government argues that neither the UK nor the EU wants the backstop and so it is unlikely to last. Northern Ireland would also stay aligned to some EU rules, including in some areas of the single market. This would avoid checks at the Irish border — but would mean some controls between Northern Ireland and the rest of the UK. Tory Brexiteers and Northern Ireland’s Democratic Unionist Party (DUP) – which has been propping up May’s government — hate anything which sets Northern Ireland apart from the rest of the United Kingdom. They have not been placated by attempts to minimise differences and cite May’s own insistence on “no border down the Irish Sea”. The UK, including Northern Ireland, and the EU also commit themselves to a “level playing field” over tax, the environment, social policy, state aid and competition. The UK would have to align with future EU changes. Although independent bodies are given a role, the European Commission and the European Court of Justice retain major powers of oversight concerning Northern Ireland — and to some extent for the UK as a whole. To exit the backstop, either side can propose such a move to a Joint Committee — which can consult joint UK-Ireland institutions. The UK cannot unilaterally leave — although the government argues that changes agreed with the EU mean the UK cannot be trapped in the backstop indefinitely. The lack of ability to leave the backstop unilaterally has particularly enraged the pro-Brexit camp. They have argued that UK independence is seriously compromised if customs union membership is indefinite. The British government has said that this would be highly unlikely as neither side would want it. The EU is anxious to stop the UK exploiting backstop arrangements to engage in unfair competition via “back-door” customs union membership. Why is the Irish border issue so complex? What 'alternative arrangements' are there to the Irish backstop? Can technology remove the need for the Irish backstop? Although a joint UK-EU committee and an arbitration panel would try to resolve disputes, the UK would remain under the jurisdiction of the European Court of Justice (ECJ) during the transition. Afterwards, its rulings would no longer have direct effect in the UK but it would retain influence. One contentious issue — that of fishing rights — is left to be dealt with on another day. The agreement says the EU and UK should do their best to strike a separate deal on access to UK waters for EU fishing boats. A protocol on Gibraltar — the British territory on the southern tip of Spain – seeks to ensure in particular that citizens’ rights are respected. Another, on Cyprus, aims to preserve the current situation — keeping the British military base in the EU’s customs territory. The 26-page Political Declaration accompanies the Withdrawal Agreement and sets out the basis for future relations, including trade. Euronews has previously examined it in more detail here. This document is not legally binding but defends the core principles dear to each side: the integrity of the single market and customs union for the EU, and sovereignty for the UK. At the same time, it says future ties should be as close as possible. Unlike Conservative Eurosceptics and Northern Irish unionists who have focused their hostility on the backstop arrangements in the Withdrawal Agreement, the UK's Labour Party has has emphasised its opposition to the Political Declaration. Leader Jeremy Corbyn has argued that the document is too vague and would lead the UK into a "blindfold Brexit". Last-minute moves by Prime Minister Theresa May to seek a compromise deal with Corbyn put the focus on Labour's demands for a customs union with the EU – an issue that could be addressed by adapting the Political Declaration, as confirmed by the EU's chief Brexit negotiator, Michel Barnier. 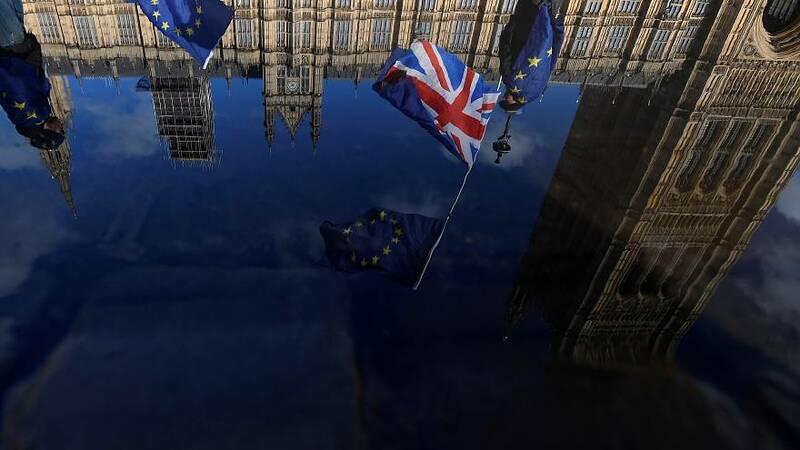 All three votes in the House of Commons, on January 15, March 12, and March 29, saw an unlikely alliance of Brexit supporters and opponents come together to reject the deal by emphatic margins. The EU refused to renegotiate the withdrawal agreement itself following the first parliamentary vote – even though the House of Commons voted to send the government back to Brussels to seek "alternative arrangements" to the backstop. A “joint interpretative instrument” allowing the UK to seek arbitration and an exit from the backstop, if the EU deliberately tries to keep the UK permanently inside it by failing to negotiate a new trade deal in good faith. A "joint UK-EU statement" added to the Political Declaration which deals with future relations. This commits both sides to seeking alternative arrangements for the Irish border to replace the backstop by December 2020. A “unilateral declaration” by the UK, with EU approval, saying nothing would stop Britain from taking steps to leave the backstop if relations broke down. On the morning of the second vote the government's chief legal adviser, the Attorney General Geoffrey Cox – whose advice is influential with Brexiteers – issued a new legal opinion. He said the legal changes reduced the risk that the UK could be held indefinitely in the backstop against its will. However, crucially he also wrote that the revised divorce deal did not give the UK the legal means to exit the backstop unilaterally if "intractable differences" arose. It wasn't enough to change the minds of Northern Ireland's DUP and leading members of the Conservatives’ anti-EU European Research Group (ERG). Most again rejected the revised deal, which consequently suffered a second defeat. The government decided the third vote in the House of Commons would be only on the withdrawal deal, not on the declaration on future relations. This was partly to conform to a ruling by the Speaker who insisted on substantial changes from the previous vote. However, it still ended in defeat by 58 votes. After three defeats for the deal – what next? Amid the parliamentary deadlock over Brexit and the repeated defeats for the negotiated deal, leaders of the other 27 EU countries agreed to extend the date of the UK's departure until October 31. Unless the withdrawal deal is ratified quickly by the British parliament, then as a member of the European Union, the UK will take part in elections for the European Parliament in late May. Theresa May's government continues to seek a compromise with the Labour opposition, a move seen as a last-ditch effort to get a withdrawal deal through parliament. MPs have reinforced their opposition to a "no deal" Brexit with legal moves to force the prime minister to seek a further delay if no agreement is passed. However, two rounds of non-binding "indicative votes", designed to find alternative options to the negotiated UK-EU deal, have failed to secure a majority of MPs in favour of any proposal. EU leaders are due to assess Britain’s progress over Brexit at a European Council summit on June 20-21.